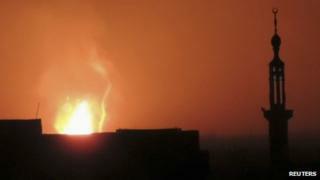 Large parts of Syria have been hit by a power cut following an explosion near the airport in the capital, Damascus. The lights went out after rebel artillery reportedly hit a gas pipeline that supplies a power station. Residents say the entire capital has been plunged into darkness and officials said the power cuts had been nationwide. Many parts of Syria have suffered sporadic power cuts since the start of the country's civil war. "A terrorist attack on a gas pipeline that feeds a power station in the south has led to a power outage in the provinces, and work to repair it is in progress," Syria's state news agency Sana quoted Electricity Minister Imad Khamis as saying. He said it could take up to 48 hours to restore supplies. President Bashar al-Assad has frequently referred to his opponents as foreign-backed "terrorists". UK-based activist group the Syrian Observatory for Human Rights (SOHR) said rebel shelling had been aimed at the town of Ghasula, around 2km (1.2 miles) from the airport. US believes Syria's arsenal can be "delivered by aircraft, ballistic missile, and artillery rockets"
"It is likely this was a large-scale operation planned well in advance," Observatory director Rami Abdel Rahman told AFP. Activists say a huge fire was seen blazing near the airport. It is unclear whether anyone was hurt. Meanwhile the SOHR says a car bomb has hit a military checkpoint in a western suburb of Damascus, causing multiple casualties among security forces. In another development, the body tasked with destroying Syria's chemical arsenal has said that Damascus is due to hand over its disarmament plan on Thursday. In a press conference on Wednesday, the Organisation for the Prohibition of Chemical Weapons (OPCW) said it expected Syria's initial declaration within the next 24 hours. The OPCW and the UN have had a team of 60 experts and support staff in Syria since 1 October. They have said that the Syrian government has been co-operating with the watchdog's work. The OPCW's mission to rid Syria of chemical weapons was set up by a UN resolution. It followed international outrage at a chemical weapons attack near Damascus in August.